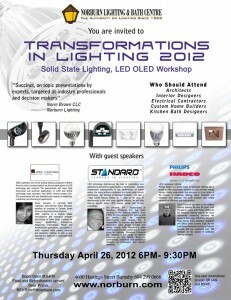 Posted March 27, 2013 by Norburn Lighting and Bath Centre & filed under In The News, LED, New Products, Tips and Advice . There is general agreement that we have barely begun to unlock the full potential—and energy saving impact—of LED and OLED technology. 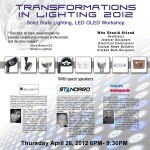 This gathering of lighting professionals is an opportunity to meet lighting industry leaders to explore and gain a deeper understanding of the improvements innovative new directions in solid state lighting And with its focus on the cutting edge, it’s a way to stay current with an industry moving at warp speed. This workshop offers a unique forum to learn, share, interact, and build partnerships. Invited speakers and industry professionals will share insights on the latest technology advances and what this means for the construction and renovation industry. As the aging adult population continues to increase in North America, quality lighting’s role in meeting the needs of an aging visual system becomes ever more important.As we age, even healthy eyes become more sensitive to glare – they require higher contrasts to see than they did when we were younger, as well as higher illumination levels. The need for higher light levels also means that control of sources of light is especially important. This seminar describes some of the changes that can be incorporated in to a home’s lighting design to make it more comfortable and secure.